One of Britain’s most successful dressage riders, Carl Hester MBE is an Olympic gold medallist and multi-medallist at european and world championships. He is also the holder of more than 65 national dressage titles. Carl grew up on the Channel Island of Sark, where his first mount was a donkey called Jacko. He moved to mainland Britain aged 16 to work at the Fortune Centre of Riding Therapy in Dorset. Just 18 months after taking up dressage, Carl became national young rider champion. In 1989, Carl started riding for the Bechtolsheimers. In his three and a half years with them, Carl went to the World Championships in 1990 and the European Championships in 1991 on Rubelit Von Unkenriff, as well as the 1992 Barcelona Olympics on Georgioni. Carl credits the Bechtolsheimers for setting him on his path to international success. Read more about Carl’s career. 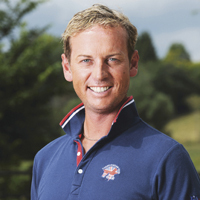 A top trainer as well as a competitor, Carl is the mentor of world number one Charlotte Dujardin and part owner of the dressage wonderhorse Valegro. Carl has successfully trained numerous horses up to grand prix level dressage during his career. His current top horse is Nip Tuck, aka Barney, who Carl rode at the 2014 World Equestrian Games, the 2015 European Dressage Championships, the 2016 Rio Olympics and the 2017 European Championships. Carl unveiled an extremely technical new freestyle floorplan at Olympia 2015, which was described as ‘a degree of difficulty that was just amazing’ by president of the ground jury, Stephen Clarke. This saw Carl achieve his first ever win at the show. Carl is a regular columnist for Horse & Hound magazine. H&H VIP members can read his latest thoughts online. ‘Uncle Carl gave me a lesson on Valegro’: do Christmas presents get any better than this?